Saree as we always define it to be an ethnic yet quintessential outfit in the Indian woman’s wardrobe. The core of any good saree wardrobe is to have at least one traditional saree from every region from India. In addition, there should be some plain, single colored sarees, to show off accessories –be it elegant jewellery or shawl to perfection. Playing with color, fabric, weave and embellishments can create an exquisite look to the wardrobe. These are sarees created by dyeing the cloth in such a manner that many small resist-dyed ‘spots’ produce elaborate patterns over the fabric. The traditional bandhani market has shrunk however, because of the rise of low-cost silk-screened imitations and most modern bandhani sarees are made with larger designs and fewer ties than in the past. There are varieties available in two contrasting colors, with borders, end-pieces and one or more large central medallion called a pomcha or padma (lotus flower). Red and black is the most common color combination but other pairs of colors are also found. 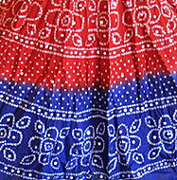 For instance, the panetar saree is a Gujarati-Hindu saree of satin weave and Gajji silk with red borders, central medallions and a white body, which may contain regularly spaced red tie-dyed spots. The most time consuming and elaborate saree created by the western region is the potole (plural patola) which has intricate five color designs resist-dyed into both warp and weft threads before weaving. 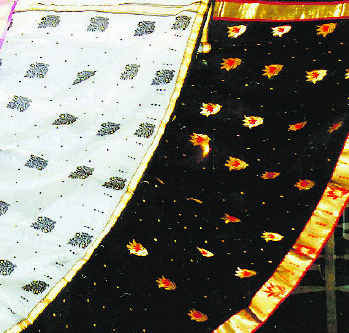 1.Butis (circular designs) woven into the field in the warp direction instead of the weft, resulting in their lying horizontally instead of vertically on the saree when draped. 2. 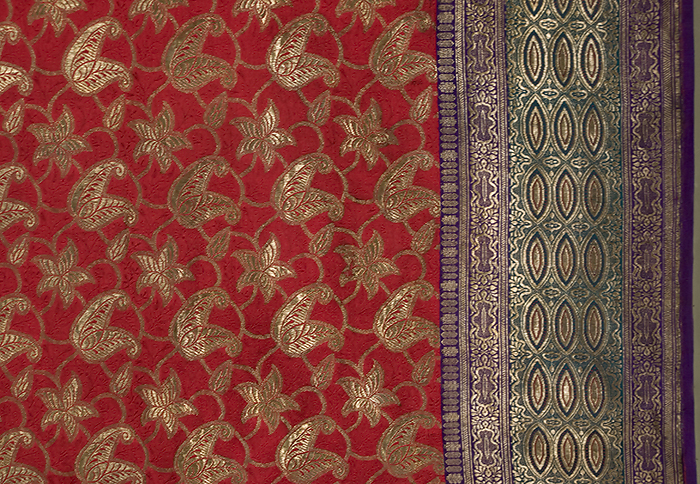 Floral designs woven in colored silk, against a golden (woven zari) ground fabric. Although such ‘inlay’ work is a common feature in many western Deccan silks, the Gujarati work usually has leaves, flowers and stems outlined by a fine dark line. This saree is named after a village near Aurangabad in Maharashtra. Now also woven in the town of Yeola, these sarees use an enormous amount of labour, skill and sheer expanse of material in their creation. Distinctive motifs such as parrots, trees and plants are woven into the saree. The shades vary from vivid magenta, peacock greens and purples. In the pallav, the base is in gold and the pattern is done in silk, giving the whole saree an embossed look. The Chanderi saree from Madhya Pradesh is light and meant for Indian summers. It is made in silk or fine cotton with patterns taken from the Chanderi temples. 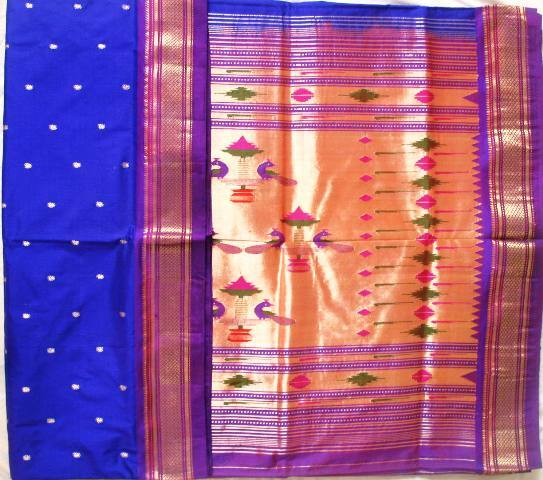 The Maheshwari sarees are also both in cotton and silk, usually green or purple with a zari border. 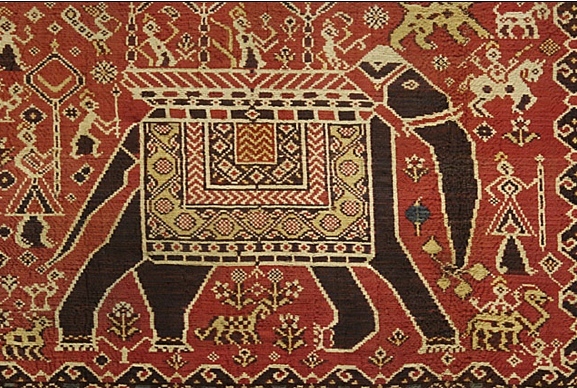 The traditional block-printed tussar can also be found in contemporary designs nowadays. This saree from Banaras is virtually mandatory in the bride’s trousseau. These sarees vary tremendously as weavers create different products to suit different regional markets and changing fashions. Most brocade usually has strong Moghul influences in the design, such as intricate intertwining floral and foliate motifs, kalga and bel. A characteristic found along the inner, and sometimes outer, edge of borders is a narrow fringe like pattern that often looks like a string of upright leaves called jhallr. This is almost a signature of Banarasi. No Indian bridal trousseau is complete without the ‘Kanjivaram’ saree, characterized by gold-dipped silver thread that is woven onto brilliant silk. Kanchipuram is a town in Tamil Nadu with more than 150 years of weaving tradition – completely untouched by fashion fads. Kanjivaram is favored for their durability. Kanji silk is thicker than almost all other silks, and is therefore more expensive. The heavier the silk, the better the quality. Peacock and parrot are the most common motifs. Though lightweight kanji sarees are popular as they are easy to wear and cost very little, the traditional weavers do not like to compromise. While Korean and Chinese silk is suitable for light-weight sarees (machine woven), only mulberry silk produced in Karnataka and few parts of Tamil Nadu, is right for the classic Kanjivaram. Pashmina silk, Kota silk, Mysore crepes, pochampallis and puttapakshi sarees are also popular South Indian sarees. 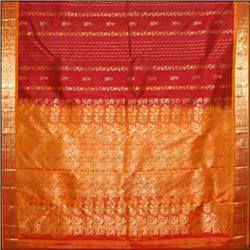 Typical wedding sarees from Kerala are the nayayanpets and bavanjipets which usually have a gold border on a cream base. Traditional colors for these sarees are earth shades of browns, greys and off-whites. However, brighter shades have been introduced for the North Indian buyer. Good to know that you like. Do keep reading and feel free to give your feedback / suggestions..
Dear Wendy I myself write these articles doing research online and get advice from experts at times. Good to know that you loved my blog article.